To calculate the fare to expect, use our new Philippines Taxi Fare Calculator. Drag marker A to your start point.Then drag marker B to the destination. The best route is marked on the map. The estimated fare is displayed on right side together with the estimated travel time and a step by step road-trip. One usually sits in the back of the taxi, but some drivers like company and invite you to sit aside them. Taxis may only be found in cities. 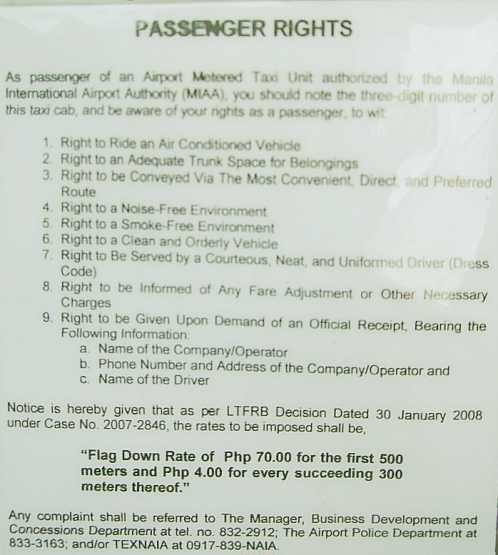 Taxis can be found waiting at airports, sea ports and bus terminals. They can also be called in any spot in town by simply waving your hand. More often you will be recognized as a tourist and each empty taxi approaches you, the driver honking like a madman. Taxis can be "dealer new" Toyotas with a few 100 km of life. They can also be very old, rusty Chryslers hold together with a lot of rusty wire and tape. Lots of drivers are fine guys and give you free information about their city and much more. Unfortunately there are also less honest drivers and black sheep. There are also places of real organized fraud, where we do not recommend to ride a taxi. Please see below. New alternatives have come up since 2014. Brands such as UBER, GRAB and EASY TAXI are now available in Manila and in Cebu City. The standard Filipino cannot read maps! Map reading isn't a subject in grade schools. We see this almost every day in our inquiry mail. 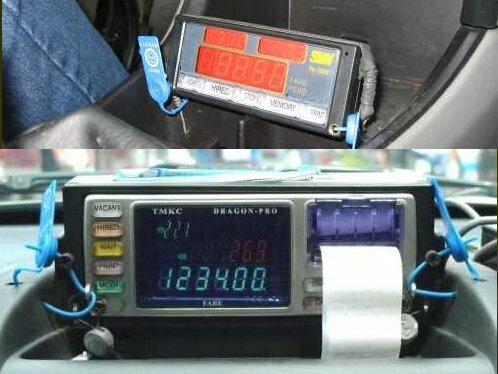 Our Philippines Taxi Fare Calculator although simple, cannot be used, because people do not know how to find a specific spot on a map. 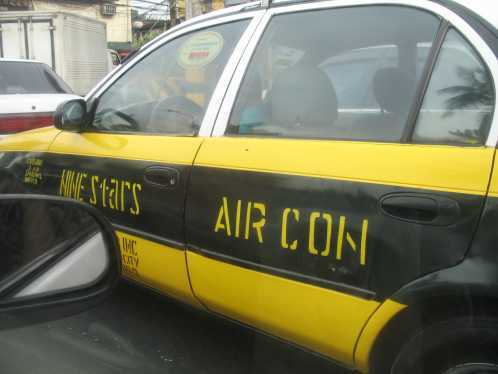 If you have never used a taxi in the Philippines, the "coupon taxis" might be best choice. Their fixed tariffs might be higher than the ones of the metered taxis, but only if their drivers are honest. PHP 4.00 every 300 meters afterwards. PHP 4.00 every 2 minutes waiting or standing in traffic. PHP 3.50 every 300 meters afterwards. PHP 3.50 every 2 minutes waiting or standing in traffic. * They are not all white but most of them. You can use this map all over the Philippines. Use the zoom function. You may even have a look at any point of your journey - simply use the "streetview peg". Taxi drivers usually are neither owner of the taxi nor employees. The drivers rent the taxi per day from an owner of a car pool. 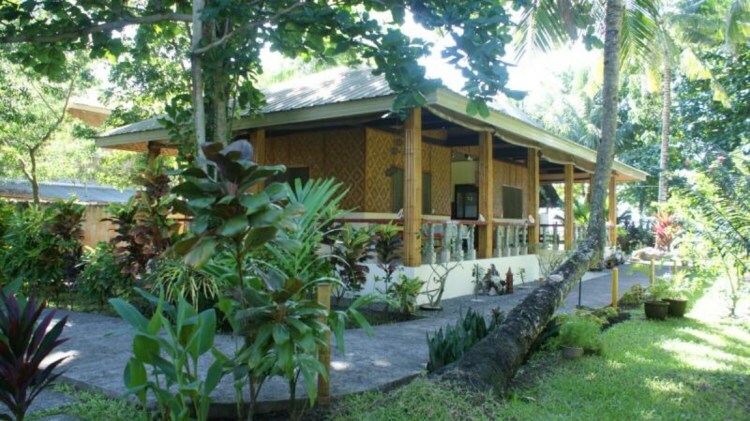 The driver has to pay between 1200 and 2400 pesos for a 24 hours use of the taxi. He has also to pay the fuel. One often sees taxi drivers getting gasoline or diesel for 100 pesos only, just enough for the next short trip of maybe 10 kilometers. 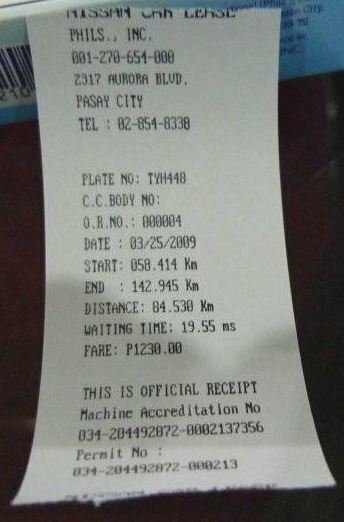 A honest driver can make up to 3600 pesos within 24 hours. But these means 2 naps of 4 hours and driving the remaining 16 hours, having the car always hired and doing short trips only. In real life a taxi driver earns maybe 1500 pesos a day. This is why we always give a tip when the driver is correct and helpful. Read also the 'theoretical' passenger rights. At this very moment March 1, 2017, UBER and GRAB are only available in Metro Manila and Cebu City. In these two mega-cities customer feedback is positive and fares are competitive. You can find such a car from a sharing pool really anywhere in and around the city, whereas you may encounter troubles in to find an ordinary taxi in many spots. In our opinion it is also safer to hire a ride from UBER or GRAB from within a restaurant than standing on the curbside of a badly lit road in a not too safe spot. You can track "your" driver, when approaching and step out in the moment the car arrives.